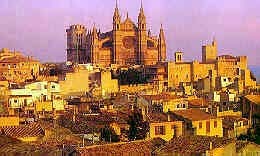 Mallorca offers many contrasts from the excitement of the cosmopolitan city of Palma to the seducing, idyllic inland landscapes. The island that has even seduced the King of Spain, the largest of the Balearic Islands plays a leading role in the international tourist industry and this summer plays hosts once again to the top men's and women's Beach Volleyballers on the World Tour. Last year's men's tournament established the sport on the island, where the Brazilian duo of Emanuel/Tande battled out a 78 minute epic grand final over Baracetti/Conde to capture the first ever title in Mallorca. Now a double-gender event, the sand will sizzle from 3-8 September with the premiere teams on the world circuit.